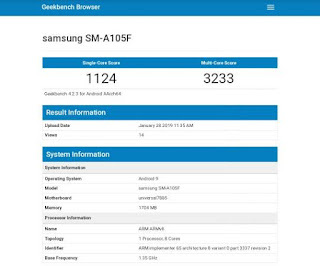 Samsung's low-budget phone, Samsung A10 has appeared at known benchmarking website Geekbench.So, this phone is likely to be released soon including India.But other features of the phone are unavailable beyond the information provided by Geekbench. 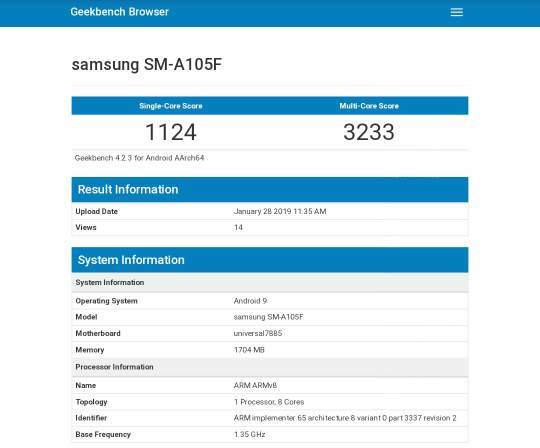 Going through benchmark details of Samsung A10 we can see that the device is running on Samsung own Exynos 6885 chipset with 2GB of RAM.Its maximum clock speed is limited to 1.8GHz.It also shows that the device will come with Android 9 Pie out of the box.However,the phone has scores 1124 on single core test and 3233 on multi core tests. 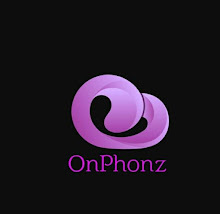 The expected features of this smartphone includes 5.5 inch HD full view display.For photography it may feature dual camera setup at rear and single snapper at its front.It would launch with gold,black and blue color variants.